I may have sat on Dover’s beach on that sunny September afternoon in 2012, congratulating myself on having finished the North Downs Way, but in reality I needed have bothered with those last two days. In actual fact I could already claim to have completed the trail. Because I had. Several years before I’d even begun it. It was all Catherine’s fault. My partner had started doing the same trail in 2006, also completing it mostly in day walks. But for various reasons, none of her trips had managed to include the final stretch to Dover. By the time 2009 came around, she really should get it all finished. For her though, staring at the signpost at Boughton Lees had given her a different result. Not for Catherine would there be a triumphant final day departing from the shadow of Canterbury Cathedral. No. Instead she’d decided to do the southern loop, heading down towards Folkestone and then a walk along the famous white cliffs of Dover. She did that final stretch in a February weekend in 2009 and had asked if I’d like to join her. It would be fun after all. And so it was that bright and early one Saturday morning we left Wye station and set off on our way; strolling through Wye with its assorted collection of twee looking cottages and restaurants. It was too early for such distractions. After all, the Wye Downs beckoned, home of the Wye Crown a giant chalk-stone crown carved in to the hill by students in 1902. Why? Well to commemorate the coronation of King Edward VII of course. Those scholarly wags eh? Always up to their pranks. Deserve ASBOs, the lot of them. Presumably no one had got round to cleaning it all up yet. I made a mental note to report the issue to the local council. 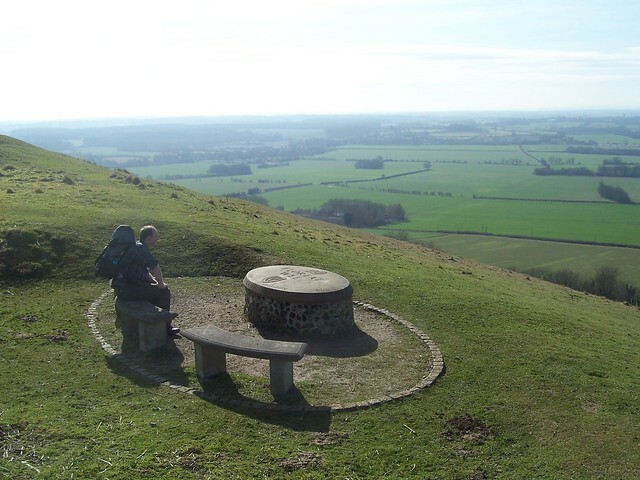 The Crown itself was presumably best viewed from afar; certainly the North Downs Way didn’t offer a particularly great vantage point to view it as the path headed to the top of a hill that the crown was set on. And when we did get to the top a stone slab commemorated the creation of the memorial that we could now no longer see properly. 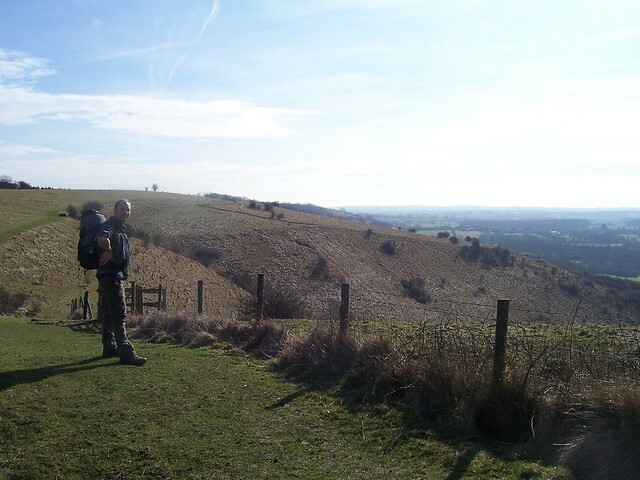 Of course the North Downs Way hadn’t taken us up here for the view but for some classic ridge walking. 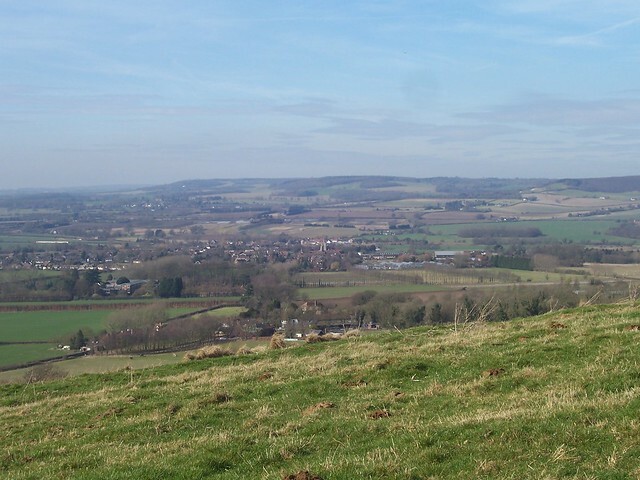 With the village of Wye nestling down below, we headed off over the Wye and Broad Downs, lolloping lazily along the wide grassy paths. After a bit the grassy paths became tracks and deserted country lanes as we cut our way gently across Kent, stopping in a field to watch the sheep and eat our lunch. There were few people, and even fewer when we arrived in the village of Stowing. Despite the houses there was no one around. Being ahead of schedule we stopped off for refreshment in the Tiger Inn, only to find the local population weren’t all hiding in there either. Still there was, at least, someone behind the bar. 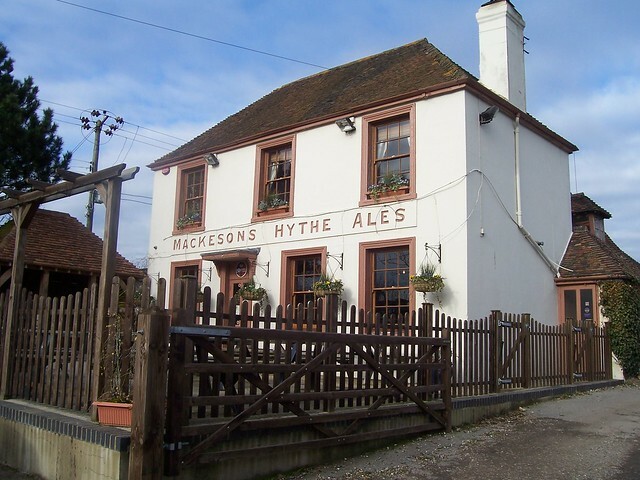 The front of the pub proclaimed it to be a retailer of the long lost “Mackesons Hythe Ales”, although there wasn’t much Mackesons to be found. The brewery’s long gone, having been closed in 1968 as part of a wave of consolidation that hit the brewing industry. Most of Mackeson’s beers are long gone, but one holds on, desperately clinging on. Mackeson’s were famous for its Milk Stout and it continues to be available in cans and bottles. A majestic beer, it languishes mostly unloved in the beer section of supermarkets; few pubs stocking it any more. The pub many not have offered any milk stout, but a sign did tell us that the car park offered ample parking for your horse should you have brought one with you. Checking our rucksacks revealed we hadn’t got a horse with us, so we made do with sitting in the pub’s beer garden with a pint of ale, relaxing in the sun before looking at our watches and realising we really should be going. Our destination of Etchinghill was still some way away yet. 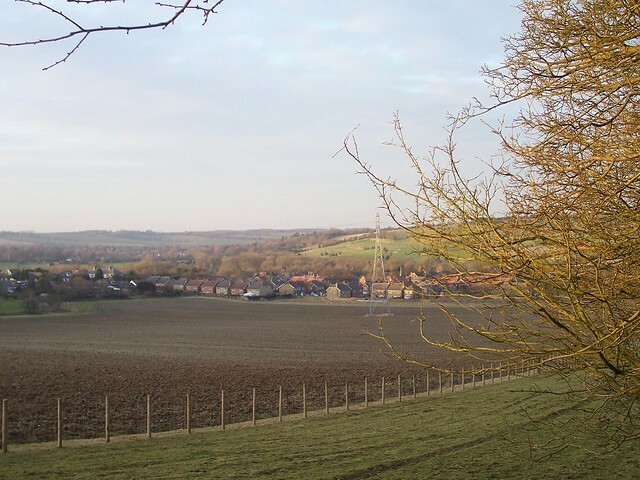 Tracks, fields and ridges – the North Downs Way now offered them all and near Postling it added in a huge number of electricity pylons as well, along with the two massive radio transmitters of Swingfield Radio Station. 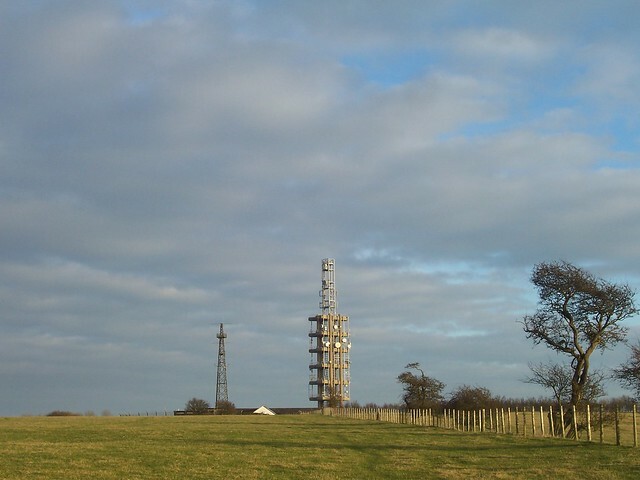 The two masts, one encased in a strange concrete trellis like construction, pump out a mixture of mobile and VHF signals to this end bit of Kent; their location being so close to the coast that there may even have been a bit of seepage in to France. The twin giants dominated the landscape for a while, the North Downs Way taking us closer and closer to them, until it passed right next to them. I stared at them and thought of all those voices and sounds carried silently through the air to these masts, pondering their role in connecting the world. Just what was being said via those signals. Then I looked at my watch and ran to catch up with Catherine who’d long tired of waiting for me and had wandered off as I’d dreamily looked at the sky. For her, Etchinghill was waiting. The village pub would soon be open and our table waiting to give us our evening meal. It was time to run to catch up, for our day of walking was almost over. Next time: hi ho, hi ho, it’s off to the Port of Dover we go. Again. Yet also three years earlier than the last time I was there. First Published: 25 February 2013. Last Updated: 24 November 2014.